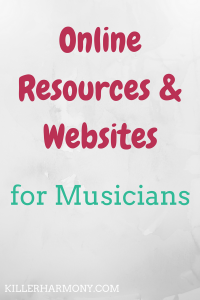 When it comes to music, the internet is filled with resources to help us out. There are websites like YouTube where you can find free recordings of pieces, online metronomes, and even sheet music downloads. I love using the internet to help me. I have found a lot of sheet music, music tips, and also career tips. In this post, I am going to share my favorite online resources with you. I hope you find something that helps. The International Music Score Library Project (IMSLP), or Petrucci Library, is a huge library. You can find so many different pieces from solo works to full orchestral scores. Some pieces also have audio recordings that you can download. There is music for almost every instrument, even some obscure ones. You can search for instrumentation, composer, style, or for a specific piece. It is completely free to use, and I cannot recommend it enough. If you want to learn a piece or practice your score study skills, IMSLP probably has what you’re looking for. The only difficulty might be finding pieces that are still protected under copyright. This website is great for beginner musicians and music teachers. There is a decent amount of sheet music for most of the orchestral instruments and a few others. Instruments outside the orchestra include piano, recorder, saxophone, guitar, and ukulele. You can find music of different genres, like jazz or music for different holidays. There is also a forum and a music theory section to add to the website. If you need to listen to a piece of music, check YouTube. You are bound to find many recordings, some better than others. But the sheer amount of recordings, especially for popular works, means that you can hear different interpretations of the piece. You can also listen to different recordings by some of the great players of your instrument. Listening to professionals is a great tool when learning an instrument. Teachers can use YouTube as a way to market to students by sharing videos and recordings. Show off your skills. A YouTube channel can be a great way to attract students and clients. Oh, Amazon. How I love thy Prime. But seriously, Amazon is a great place to find sheet music and other music accessories. If you procrastinate buying a piece of music, Amazon Prime will deliver it in two days. I haven’t been able to buy everything from Amazon, because they aren’t a music library, but it’s nice. I can also look for music stands, instrument stands, and other music supplies on there. They have a pen that is set up to create a music staff for you. You need Amazon Prime in your life. If you don’t listen to anything else in this post, listen to this. Especially because you can use Amazon for more than just music. I have yet to order from SMP, but I have heard good things about it. You can find music to download and music to order. I’ve seen music from all genres on there. It’s pretty cool. The downside to using it as opposed to other sheet music websites is that the music costs money. But you can support other musicians by using it. If you are a composer or arranger, look into this website as a way to publish your music. I am considering this for the near future, because it seems pretty cool. You can publish original music or arrangements of songs in their library and earn royalties when people purchase it. Of course, I had to list my own blog and site. I post twice weekly about music. I share music tips and information with the goal of making music more accessible to everyone. Music, especially classical music, isn’t always as appreciated as it should be. My dream is to pursue this thing full time and to create a valuable resource for musicians of all genres and levels. If you want to go behind the scenes, I suggest you follow me on Instagram (@KillerHarmony) and subscribe to the blog at the end of this post. Did I miss any music websites? What are you favorite music resources? Let me know in the comments!